Cleeve’s Confectionery is an Irish brand that is much loved and well-known from years previous which has now returned to the shelves after 30 years. All of Cleeve’s products are produced in Newbridge and carry the Guaranteed Irish logo to reflect that they are manufactured in Ireland, something of a rarity in the confectionery industry these days. The Cleeve’s branding gives a nod to its vintage roots – the logo very similar to the original from 120 years ago. The bright colours of the hanging bags pop, they can be placed on hooks or are shelf ready in their box. The bars have a Willy Wonka likeness to them and a retro look to appeal to all ages. Cleeve’s is exclusively distributed by Ampersand, an FMCG distributor based on the Naas Road. Ampersand are experts in the convenience sector and have steadily extended their snacking and confectionery portfolio in the last 5 years. Best known for slab toffee which was produced in Limerick from the late 1800s, the product was exported all over the world and is fondly remembered as being an integral part of Ireland’s confectionery industry for most of the 20th century. Now in 2018, the new confectionery line features a range of hanging bags and bars. Original Toffee pieces return as a hanging bag, as well as Original Chocolate Caramels, Original Fudge, Lucky Numbers assortment and Original Iced Caramels. The Iced Caramels sweet is a unique product, produced only in Ireland by Cleeve’s which is now located in Newbridge, Co. Kildare. Iced Caramel’s complicated manufacturing process has been practised by Cleeve’s since 1990. Previous to this it was produced by Clarnico Murray who subsequently sold to Cadburys and since 1990 the Cleeve’s factory produced Iced Caramels under the Clarnico brand for Cadbury, then since 2007 under the Lemon’s brand and now in 2018 under its own Cleeve’s brand. 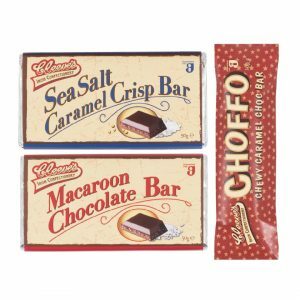 The range of bars includes Original Macaroon , Sea Salt Caramel Crisp and Choffo Bar, a chewy caramel chocolate bar. Address: Ampersand, Naas Road, Dublin 22.